Thank you to Rosie and Paul. They introduced us to this area of Spain. 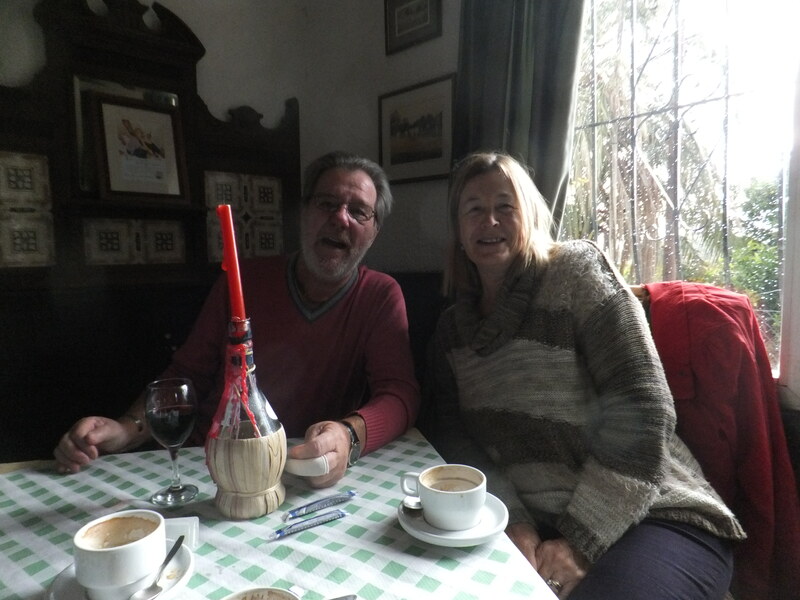 They have shown us several bars and restaurants and encouraged us to adjust to the Spanish lifestyle of lots of wine with a long lunch! Thank you for all your help. Have a safe flight home and we’ll see you again in March 2014. A big sigh of relief. Well, a day has dawned that we had serious doubts would ever arrive. The caravan is finally repaired! True, it’s not quite the right window, we haven’t got the scratches knocked out, and the water heater outlet is from a different model, but at least I don’t have to walk past it and be reminded of the worst day of our entire trip every time. Life here is getting very busy. As usual I seem to have got myself somewhat overstretched. Currently singing in two choirs, with nine concerts between now and Christmas, and some of the music has to be learned by heart. Also doing two Spanish lessons a week, plus we are still persevering with ballroom dancing (quite why I’m not sure, as we are both terrible), and ceroc, which is modern Jive. We’re not good at that either, but at least it gets us out into the warm. We wake up most mornings to beautiful blue skies, and it is quite warm outside but freezing in the house for most of the day. Then as soon as the sun disappears behind the mountains it gets really cold, and we spend most of the evening trying to keep up with the speed at which the woodburner consumes logs. I’m thinking of taking up smoking again to try and protect my lungs from the woodsmoke! We usually manage to heat about ten square feet of the lounge adequately. but visits to other parts of the house are undertaken with extreme reluctance. That said, we are both enjoying life. Ann is painting again, and I’m creating monsters out of old vine roots. I sometimes think it’s time to get a life! We have also started making a few friends, and Ann has adjusted extremely quickly to the idea of three hour lunches. I still prefer a quick sandwich, but no doubt that will change. All the best, Andy. Wayne and Pip are fellow travellers. 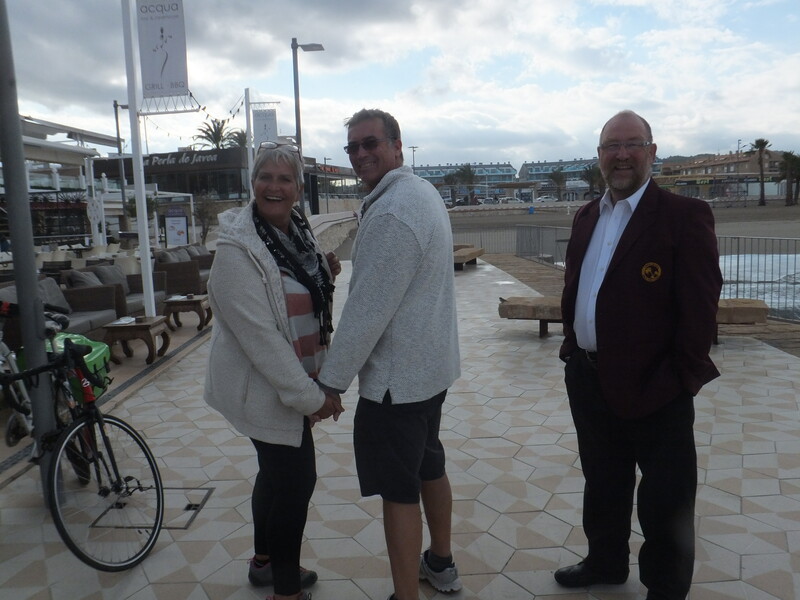 They are away for a year in their mobile home and have stopped in Javea for a few months. They are brilliant dancers and introduced us to ceroc at the Tortuga bar. Costa Blanca Male Voice Choir’s new member! We had a fantastic day at this restaurant with Rosie and Paul. The finca is 300 years old. You get five courses, all delicious. Guitarists entertain you and you can have as much wine as you like! All for 18 euros a head!! You definitely need a siesta afterwards. Something of a shock to the system! Well, I suppose it had to happen eventually! Summer came to a sudden end with the storm, but what caught us by surprise was the sudden drop in temperature to 4C the following day, accompanied by a bitter Northerly wind. There was snow on the nearby mountains, and as we had feared the house is virtually impossible to heat. With high ceilings, single glazing, stone floors and absolutely no insulation any heat generated simply dissipates into the ether. We spent the evening huddled round the wood burner trying to prevent our assets from getting frozen, and went to bed at about 9pm having burned about two week’s supply of logs in an evening. We have bought two oil fired radiators which are having no effect at all, and will be buying an electric blanket and two cubic metres of logs tomorrow. 10 centimetres of rain last night! We woke up this morning to find ourselves paddling around the lounge and dining area and the second bedroom was pretty wet too. Andy went down to the estate agent who called the owner. To be fair, she came straight away. We showed her the wet floors. We mopped up and thought, actually we didn’t have this problem in our grass hut in Mozambique. Hey ho!